Chips are my weakness. Not chocolate, not candies. Well Pocky actually comes close but still nothing trumps chips. It's weird because I'm not even a big snacker but I cannot say no when someone offers me chips. Chips seem to have some magical power on me...a magnetic pull of some sort. If I'm at a party and there are bowls of chips out you would probably see me guarding them all night (ya I'm that girl). But the absolute worst would have to be when I'm like "Screw it I'm just gonna have a few!" and open a bag of chips at home. A few? That never happens. NEVER. More like half a bag or 3/4 of one! Then what follows is just self-loathing and it's ridiculous because it happens every single damn time. Are you one to understand my love and hate relationship with these crispy things? If your answer is "yes, of course!" then understand that there was absolutely NO WAY I would skip out on the launch of Neal Brothers' Maple Bacon Kettle-Style Chips at Amsterdam Brewery, right? Right??? So...MAPLE. BACON. CHIPS. And as if that wasn't enticing enough, the launch event had these Maple Bacon chips paired with Amsterdam's (@amsterdambeer) selected ales, Big Wheel Amber Ale and Market Pale Ale. Oh geez beer and chips for lunch on a Tuesday? Don't mind if I do, friends. 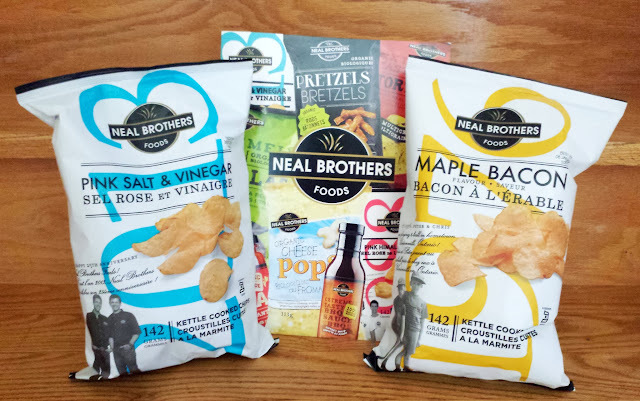 Neal Brothers Foods Inc. (Twitter: @nealbrothers, Facebook: Neal Brothers Foods) a Toronto-based boutique distribution company, brought together maple and bacon, two emblematic Canada tastes, as the fourth flavour to their established line of kettle chips. These hand-cut chips are seasoned with rich maple and brown sugar, chili pepper and other natural flavours to create a sweet flavour accompanied with smoky and savoury notes characteristic of bacon. Ahhh chips and beer. I had a lot some of this Big Wheel Amber Ale with my Maple Bacon chips...they go so fabulous together. An award winning amber, this Big Wheel Amber Ale is brewed with a blend of imported Pale and Crystal malts for a bright amber colour and sweet malt character then dry hopped with a blend of UK hops. I also snuck in some chips in my Maple Barbeque Pulled Pork Sliders :) These sliders were made by All The Best Fine Foods (@allthebestff). Chocolate brownies by All The Best Fine Foods. Brothers Chris Neal (left) and Peter Neal (right) of Neal Brothers Foods Inc.
About Neal Brothers Foods Inc. In 1988, after completing university, Peter and Chris Neal started their food production business with aspirations to create an original chip that would satisfy their customers’ flavour and nutritional demands, while complementing their own ethical philosophy. Unable to source the desired unique ingredients and preparation style of their dream product, their first foray into the responsible snack food bracket was a gourmet salad staple, “Croûtons Croûtons!” handmade in Aurora, Ontario. In 1990, their health and wellness snack business evolved into Neal Brothers Foods Inc. with subsequent launches of their own branded products. The brothers learned the vital importance of having both good distribution and brand management principles and practices, and parlayed their experience into boutique distribution and brand management services for niche international food products. Today, Neal Brothers Foods represents a group of prestige brands, which reflect the brothers’ beliefs regarding fair trade practices and environmental sustainability. Neal Brothers Foods sells through a variety of distribution channels, including well known retailers and independent specialty and natural food stores.